Sassy & Sweet Notes: Whipper Snapper Fun! Entries categorized "Whipper Snapper Fun!" I am hosting the Mix-Ability Challenge this week on SplitCoastStampers and the theme is Text / Words. Join us with the challenge, won’t you! The card I made uses my Puppy Valentine and All Things with Love cling mount set from Whipper Snapper Designs. I am hosting this week's Mix-Ability Challenge in the challenge forum at SplitCoastStampers! The challenge is called Birds of a Feather! (Mix185). Choose images of birds or feathers (stamps, papers, die cuts!) and any mixed media technique of your choice for this week's project. I created a simple beach scene with several images from my Beach Bum cling mount stamp set from Whipper Snapper Designs and colored the images with alcohol markers, colored pencil, and gel pens. I colored a background of sky and beach with a combination of colored pencils and markers. Finally, I added Stickles glitter glue to the waves and beach for sparkle and shine! The idea behind the Mix-Ability Challenge is to make mixed media simple and approachable, and to let you experiment using things you already have. Each Friday a new challenge is hosted, but there is no time limit, so you can participate whenever you'd like on each challenge. Join us, won't you!? Just a Happy Hens card to share with you -- Happy Hens, Happy Weekend! Happy Hens stamp and coordinating die set illustrated by my friend Danielle for Taylored Expressions and a few chicks and mama hen from my own Farmgirl Betty cling mount set available at Whipper Snapper Designs. Sheesh! I almost missed my chance to wish you a Happy Groundhog Day! What a bummer that would have been... Apparently, spring is headed our way early this year. We have snow in our forecast this week, so I'll believe an early spring when I see it! Walter the Groundhog is one of my new Spring 2016 images for Whipper Snapper Designs. 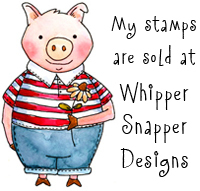 If you're in the market for some new, perfectly adorable rubber stamps, find your way to the Whipper Snapper Designs website. View the new 2016 Spring and Summer collection and treat yourself to a few new stamps! They did a GREAT job putting together a fun collection of images for this release! I've now hit 43, to be exact. Weeee!! Our challenge for August 2015 has been issued by Diane! The challenge topic is Circles of Friendship! (You can do circles, or friendship, or both!) I made this tag using my Feelin' Fishy cling mount set, available from Whipper Snapper Designs. You'll find this month's challenge gallery on SplitCoastStampers using keyword CHXAUG15. We invite you to play along! Upload your project to your SplitCoastStampers gallery, add the keyword above, and your project will be automatically added to the gallery. Or join us on Facebook! We have some new faces joining The Challenge Chicks! Hello, hello!! I'm excited to be the August Guest Designer for Crazy 4 Challenges, a group of friends that host weekly challenges on the Crazy 4 Challenges blog. According to the Holiday Insights website which lists special days for the month, this month is Admit You're Happy month. To start August challenges, we're making cards with the word "happy" on them. Won't you join us!? Head over to the Crazy 4 Challenges blog for all of the details on the challenge. I am hosting this week's Mix-Ability Challenge in the challenge forum at SplitCoastStampers! The challenge is called Doodley-dooo! (Mix128) The challenge calls for you to add your own doodles to your project. I stamped the bee, flower, and sentiment using the You Make Me Happy cling mount set from Whipper Snapper Designs, and drew in the chicken using a Sakura Micron pen. I also drew the lines at the top and bottom of the image panel. Quick and easy! I have this cute doggy themed card featured on the Sizzix blog today! Check it out! Mix-Ability Challenge: First Day of Spring! I am hosting this week's Mix-Ability Challenge in the challenge forum at SplitCoastStampers! The challenge is called First Day of Spring! (Mix112) The challenge calls for you to create a project using spring-like colors or images. To create my card, I used Lola! She's one of my Whipper Snapper Designs stamps, all dressed up for spring! I stamped Lola in black Memento ink, colored her up with ShinHan Touch Twin markers and further enhanced the image with a white gel pen and colored pencils. How could we not celebrate this day!? Today I have this project featured on the Sizzix blog. Check it out! Today I have a tutorial on the Sizzix blog for making cute Valentine themed loaf pans. Check it out! ...and retro ornament tags featured today on the Sizzix blog! I love that I was able to incorporate sentiments from my Whipper Snapper Designs Got Mistletoe cling mount set. What fun! I have these fun, sugar-free Halloween treats being featured on the Sizzix blog today! A friend recently sent me a fun package of crafty goodies, and included in the package was a cute rubber stamp. I decided to make her a thank you card using the stamp she sent, along with a sentiment from one of my cling mount sets from Whipper Snapper. She's stamped in black Memento ink and colored with ShinHan Touch Twin markers. I added freckles to her cheeks using a brown Prismacolor pencil, and sparkle to her eyes with a white gel pen. I thought she turned out pretty cute! Thank goodness it's Friday ..... this calls for a little celebration! Stamps: Loosie Goosie by me, at Whipper Snapper Designs! My friend Jeanne hosted a fun Mix-Ability challenge on SplitCoastStampers earlier this month, and I never shared my project with you! The idea behind the Mix-Ability Challenge is to make mixed media simple and approachable, and to let you experiment using things you already have. Each Friday a new challenge is hosted, but there is no time limit, so you can participate whenever you'd like on each challenge. The challenge Jeanne posted was MIX76 Finger Painting, and I kind of regressed to my childhood when I created this card. I quite literally inked up my thumb and fingers and stamped them onto my card stock. Then with a fine line drawing pen added character details to the prints and sketched in some bits of grass. Oh yes, yippeee, yahooo, this was certainly fun! Visit the SplitCoastStampers Mix-Ability Challenge forum to find out more about the weekly challenges -- the challenges are very fun, very do-able, and I hope you decide to join us! 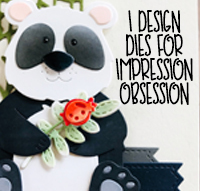 I have this fun card featured on the Sizzix blog today! Check it out! Sometimes it's just nice to send a happy hello. This card features my Inkin' Cute image, from Whipper Snapper Designs. And, a sentiment from the Everyday Sentiments cling mount set. For my card I used the Rickety House and Branch Tree Sizzix Bigz dies. I die cut the house and tree from black card stock. Behind the die cut shapes is a piece of watercolor paper that I painted/smooshed with various colors of Distress Ink. I also randomly stamped a Halloween sentiment on the background, from my Spooky Expressions cling mount set from Whipper Snapper Designs. The ghost on the card is from my Happy Haunting cling mount set from Whipper Snapper Designs. He is stamped on Neenah card stock, colored with Touch Twin markers, cut out, and adhered to the card with foam adhesive. A fun mix of cute and spooky.... just how I like Halloween. You'll find this month's challenge gallery on SplitCoastStampers using keyword CHXJUL14. We invite you to play along! Upload your project to your SplitCoastStampers gallery, add the keyword above, and your project will be automatically added to the gallery. Or join us on Facebook! I have a tutorial featured on the Sizzix blog today, featuring the Matchbook Notebook die, and lots of cute critters! Stamps: Whipper Snapper Designs, Cosmo Cricket, Stampin' Up! I'm delighted to be this week's featured designer for Tombow, and to celebrate we're having a blog hop! (Hop list below.) You should also know that along with the hop, Tombow has a prize offering. Be sure to leave a note on each designer's blog for your chance to win! Now, for the details of my card... I stamped Fishin' with Dad on watercolor paper using black StazOn ink. I then used Tombow dual-brush markers and a waterbrush to color the image. To get a soft watercolor look, I scribbled the markers onto the Tombow blending palette and picked up the color with my waterbrush. This allowed me to apply the colors much like traditional watercolors. Once the image was colored and die cut, I applied a thin bead of Aqua Liquid Glue to the edge of the panel and smeared it a bit with my fingertip. Then I used a spoon to add an ultra fine dry glitter to the wet glue, and tapped off the excess glitter. I also applied Aqua Liquid Glue to the fishing net, and applied glitter the same way. The background of my card was made using the fishy-fishy line image from the Lure the Best cling mount set. I stamped the fish over the entire panel with VersaMark ink and heat embossed it with Stampendous Kaleidoscope embossing powder. I then randomly colored some of the fish with various light blue Tombow dual-brush markers, to give a little more visual interest to the panel. Now, get ready for a wonderful dose of inspiration and check out what the other designers created for the hop. Have fun!! I hope you enjoy the hop! Don't forget to leave comments as you go to be sure you're entered for the prize package! Tombow will announce the winner on their blog, on Monday June 16th at 3:30 P.M. EST. There's a new Mix-Ability Challenge posted in the challenge forum at SplitCoastStampers! The challenge is called Some Like It Hot (Mix72), and it's hosted by me! The challenge calls for you to pull out your heat tool and use heat reactive mediums on your project. I heat embossed Stampendous Kaleidoscope powder on my fishy-fishy background. I love how the blues, greens, and purples in the embossing powder really sparkle and shine! I have a tutorial featured on the Sizzix blog today, featuring the Life Made Simple framelit hexagon background framelit die, and my girl JennyBelle! Check it out! I have this lovely Birthday Blessings Zinnia card featured on the Sizzix blog today! Check it out! Our challenge for April 2014 has been issued by Kelli! The challenge topic is Ain't No Sunshine When She's Gone (a Miss You card)! I used all kinds of things to create my card! The butterfly embellishment was made using the new Sizzix "Heart Pendant" Bigz die, by Brenda Walton. I used part of some Sizzix clear packaging, die cut the butterfly shape twice, added a few white spots to one of them, and adhered them together with foam adhesive. I added a button to the center, threaded with hemp twine. The butterfly is adhered to an office tag that I tea dyed. I use a lot of these tea dyed tags during the holidays. Also attached to the office tag is a hand-cut fishtail banner. The sentiment stamped on the banner is from my Everyday Sentiments cling mount set, from Whipper Snapper Designs. I added a hand-dyed seam binding bow to the top of the tag. The background of the card is painted, stamped, and inked watercolor paper. I was experimenting with one of my Yarka watercolor pigment pan sets last night, and created a sheet of randomly colored squares. I thought the squares created an interesting color pattern, so I cut the sheet down and used part of it on my card. For added interest, I inked the edges with brown Distress Ink, stamped it with the Impression Obsession Script Cover-A-Card rubber stamp, added a couple of postmark stamp impressions, and finally added some white gesso splatters. I had fun making this card -- a bit different from my "usual". You'll find this month's challenge gallery on SplitCoastStampers using keyword CHXAPR14. We invite you to play along! Upload your project to your SplitCoastStampers gallery, add the keyword above, and your project will be automatically added to the gallery. Or join us on Facebook! There's a new Mix-Ability Challenge posted in the challenge forum at SplitCoastStampers! The challenge is being hosted by Birgit in Sweden, and it's called Tulips (Mix62). In addition to tulips, we are to use at least three types of medium (such as acrylic, gesso, ink, etc...). Join us, won't you!? For my project, I used Jet Black StazOn ink, Distress Inks, Watercolor pencils, Prismacolor pencils, water-based markers, and gesso. Phwew! The stamps I used are all my own Whipper Snapper Designs images, including Annika, Spring Tulips, and a sentiment block from the All Things With Love cling mount set. To begin, I stamped the images on watercolor paper using black StazOn ink. I wanted the lines of the images to remain defined, and permanent. I then spritzed the paper with water and using a damp brush added various colors of blue Distress Ink to the sky area around Annika. I also added green Distress Ink to the ground beneath and around the flowers. Once those areas were dry, I continued to color the images using a combination of Distress Inks, watercolor pencils, and Prismacolor pencils. I added even darker areas for contrast with water-based markers and then blended out the colors a bit with a water brush (specifically, the darker areas on the leaves of the flowers). Once the image was colored, I stamped the sentiment block in Distress Ink using a water-misted impression so that the impressions weren't perfect. I even added spritzes of water to blend colors together a bit more. Once it was all dry, I add droplets of watered down gesso and adhered the colored image to a black cardstock base. There is so much going on in the image, I wanted to keep the rest of the card rather simple. There's a new Mix-Ability Challenge posted in the challenge forum at SplitCoastStampers! The challenge is called The Printed Word (Mix60), and it's hosted by me! The challenge is to incorporate old book or newsprint into your project. I have an old snoozy government book that I use for my crafting when I want printed pages in my projects. While the text isn't all that interesting, the paper itself is divine! To give it a bit more structure for today's project, I adhered the old book paper to a small piece of watercolor paper and tore it around the edges. Applying watercolor paper to the backside not only gives the old book paper more stability, but also allows me to do a bit more creative altering to the paper -- the watercolor paper helps to absorb moisture in the coloring mediums I use. Once I had the watercolor paper adhered to the backside of the old book paper, I added a wash of turquoise and blue ink to the page. I stamped my California Poppy stamp twice on the book paper, and twice again on watercolor paper. I colored the stamped poppies with a combination of red, orange and yellow distress ink, and cut the poppies from the watercolor paper. I used a liquid adhesive to adhere the colored poppies to the book paper, overtop of the stamped images. I added a bit of water to some white gesso and using a paint brush, added splotches of white to the panel. Finally, I added a sentiment banner using a lovely sentiment from my Blooming Expressions cling mount set. The banner is made from smooth watercolor paper, with a bit of watercolor wash and dots added for interest. The entire panel is then added to the front of a card I made from smooth watercolor paper stock. Happy Friday!! There's a new Mix-Ability Challenge posted today in the challenge forum at SplitCoastStampers! The challenge is called Washy Washy (Mix58), hosted by Jeanne! The challenge is to create a watercolor wash for your background, using inks, watercolors, or gelatos. Since this happens to be one of my favorite techniques, I thought I'd share some inspiration! For my card, I stamped the flowers and butterfly onto watercolor paper with VersaMark ink, embossed the images, and using re-inkers created a wash of color in the background. I did the same for the layer of text. I love how the colors blend together. So easy, and yet so lovely! Our challenge for February 2014 is issued by Diane! She is challenging us with the topic of My Furry Valentine, and asks us to make a Valentine using a critter themed image. I love this topic because not only do I love using critter themed stamps, but I also love making little projects for critters in our immediate and extended family! For my project I decided to make little dog treat pouches with Valentine themed toppers. I used my Twiggy stamp on one, and a Penny Black stamp on the other. These pouches are quick, easy and FUN! to put together. Christmas Wraps for Pets - Woof! And finally, in this video I share a few more details on the products I've used to make these fun teats. You'll find this month's challenge gallery on SplitCoastStampers using keyword CHXFEB14. We invite you to play along! Upload your project to your SplitCoastStampers gallery, add the keyword above, and your project will be automatically added to the gallery. Or join us on Facebook! I made a quick video of how I painted my Garden Kitty stamped image using Derwent Inktense Blocks and a water brush. And, I'd love it if you subscribed to my channel! Here's to the new year; may it bring you joy! Here's a sweet Valentine card I made, featuring Twiggy! The image is stamped on heavy watercolor paper in black StazOn ink and painted with various colors of Stampin' Up re-inkers. I added a bit of sparkle to the image with a 2-Way Glue Pen and ultra fine glitter. Hope you have a fantastic new year's celebration! Onward to 2014! I love giving repackaged treats at Christmas. Whether homemade goodies, or store bought treats that get a little packaging facelift. This year I put together some cute packages of humorous goodies, too! Using "reindeer poop" as the inspiration, I made packages of Frosty Goat Poo. Life on the farm has lots of benefits. *grin* I chose to use cute little treat bags I picked up at Michael's that have little sheep faces printed on them. Close enough to what I needed! I added a farm fresh tag and on the backside I wrote the name of the treats. Another style of treats I put together this year are packages of Hershey nuggets I wrapped with various printed papers, and packaged in long clear envelopes. I added tags to the top of the packages and cute bows embellished with buttons and snowflakes. I saw the idea for these treat packets on Pinterest, I believe. I think packaging, or repackaging gifts is a fun gift to give for Christmas. Another gift I put together this year were pretty serving bowls filled with 2 dozen farm fresh eggs. I chose pretty bowls I thought our friends would like, filled them with fresh eggs, covered with clear wrap, added a pretty ribbon bow and tag, and delivered them to their homes. They were well received! This is an idea I will be tucking away for years to come. Quick and easy! Santa's Helper is colored very simply with markers. For a bit more pizzazz, glitter could be added to the star, buckle, or maybe even the fur and ball of the hat! Happy Friday!! 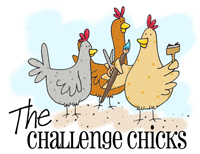 There's a new Mix-Ability Challenge posted today in the challenge forum at SplitCoastStampers! The challenge is called Chalk It To Me (MIX45), and you are to use VersaMark ink and chalks or pan pastels. VersaMark ink is a clear, sticky ink usually used for watermarking or for heat embossing. But as you can see, it also works great with chalks! For my project, I chose to use my recently released Snowflake Background stamp for the background image on this card. I stamped the image in VersaMark ink on black cardstock. Then, using a pouncing motion, I applied silver and pale blue shimmery chalks to the stamped image. The powder of the chalks sticks to the VersaMark ink, revealing the design left by the stamp and clear ink. It's difficult to see the full shimmer in the photos -- trust me, this card has some serious sparkle and shine! Even the silver mat layer is CRAZY sparkly!! The die cut I used is called Vintage Noel, from Sizzix. I adhered some vintage sheet music to some thin chipboard (for added strength and dimension) and die cut the word. I then inked the entire surface of the die cut with VersaMark ink and used various colors of chalk to add blended color to the letters. To dress up the word even more, I added a few pine sprigs that were die cut from super-sparkly silver paper. I added a little red button to the cluster for a pop of color. Our challenge for November 2013 is a sketch, issued by Kelly! She asked us to use the sketch to make a thank you card. You can keep the sketch as clean and simple as you'd like, or really go nuts embellishing your project! For my project, I chose to use one of my favorite fall themed Whipper Snapper Designs stamps, Farm Scarecrow. The image is stamped in black Memento ink, and colored with ShinHan Touch Twin markers. I used harvest themed paper from a 6x6 Recollections paper pad called Harvest Delight. I used leaves I cut from various colors of card stock, some American Crafts harvest themed ribbon, and a beautiful button from a recent RAK (Random Act of Kindness) I received from Carol Dee. Thank you, Carol Dee!! And finally, you'll find this month's challenge gallery on SplitCoastStampers using keyword CHXNOV13 . We invite you to play along! Upload your project to your SplitCoastStampers gallery, add the keyword above, and your project will be automatically added to the gallery. Or join us on Facebook! How about a birthday card, featuring the new Birthday Background, as well as Bow Wow's Birthday! The sentiment is from the 29 Again! cling mount set. The Challenge Chicks: Halloween, with a twist! Our challenge for October 2013 is being shared today! This month's challenge is Halloween, but there's a twist! It's Halloween with NO Orange, NO Green, and NO Purple! For my project, I chose to use a few of my Whipper Snapper Designs Halloween themed stamps. For the background image, I used Halloween Toss stamped in black StazOn ink on paper from the My Mind's Eye 6x6 Mischievous paper pad. I added a strip of black glitter ribbon for a little pizazz. The sentiment is from my Spooky Expressions cling mount set. I love when I finally get to pull this set out for projects!! ...and added a cute black pumpkin die cut under the black button for a little something extra. The pumpkin die is from The Stamps of Life. On the inside of the card, I added another sentiment from the Spooky Expressions cling mount set, and stamped the dangly spider from the same set. And finally, you'll find this month's challenge gallery on SplitCoastStampers using keyword CHXOCT13 . We invite you to play along! Upload your project to your SplitCoastStampers gallery, add the keyword above, and your project will be automatically added to the gallery. Or join us on Facebook! Hope you had a wonderful weekend! And here's Cutie, wishing you a happy Monday!